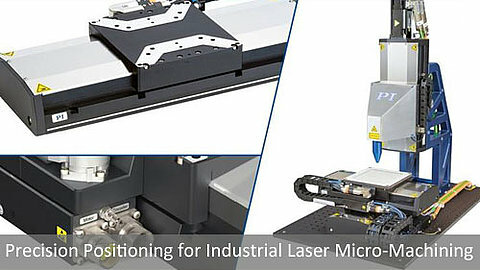 EXAMPLE: Precision Laser Machining, Flat Panel Testing, etc. 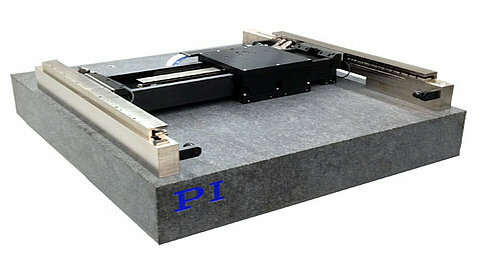 PI is a supplier of high-end multi-axis precision positioning and motion systems and makes use of own drive components and high-precision positioners to build customized positioning and automation sub-systems —“motion engines”—for our customers. The PI group employs over 1,200 people in 15 countries and runs engineering and manufacturing centers on 3 continents. 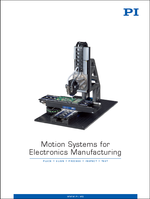 Select from the broadest portfolio of precision motion technologies, including piezoelectric and air bearing systems, with 1,000’s of standard products or have our engineers provide you with a custom solution. There is no need to spend your time comparing the features, pros, and cons of all the different drive technologies and products we provide – unless you want to. Instead, talk to our engineers first. They have access to in-depth knowledge and test data on diverse driving and guiding technologies, spanning from electromagnetic to piezoceramic and from mag-lev to air bearings. They also have experience selecting the right technology for each individual application. Often an adaptation of existing technologies/products will suffice to solve a problem. 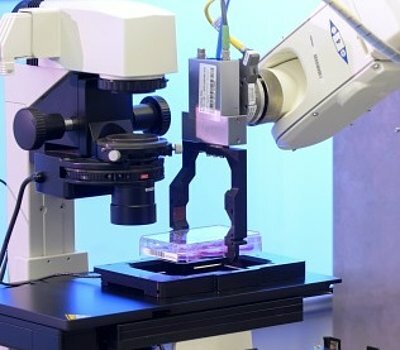 However, experience along with detailed knowledge and PI’s significant R&D investment in new technologies enables our engineers to take unique approaches. The result? 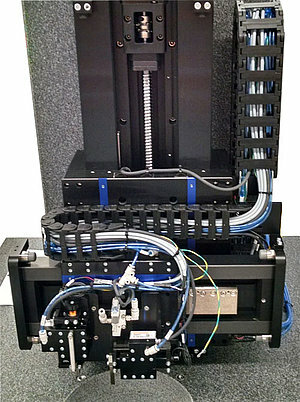 A complete motion system that fits your specs, with a well-defined interface that aligns with other components in your test or production process and lets you focus on your core business. Definition phase: Together, we identify current issues and/or the goal of your new motion system. Concept phase: Brainstorming about the best solution in close cooperation with you. 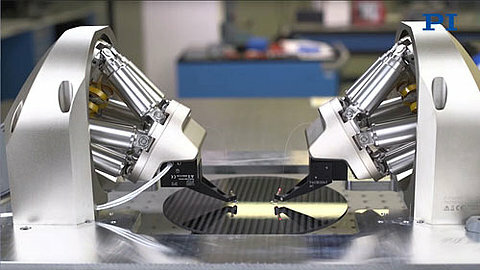 The resulting solution is converted into a Technical and Business proposal. The design and detail phase begins after your approval. The system is then assembled, tested, and delivered. You end up with a fully functioning system, and don’t have to waste time trying to integrate components from different suppliers. 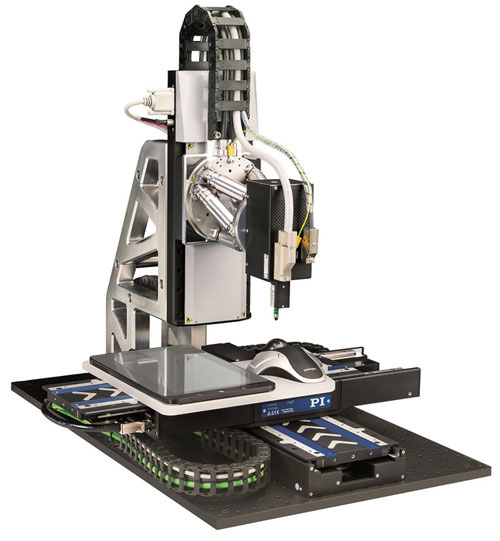 This 10-axis precision motion and positioning system includes a includes a hexapod for angular alignment along with a software programmable pivot point. A fast voice coil actuator with high-resolution force feedback operates the robotic finger. 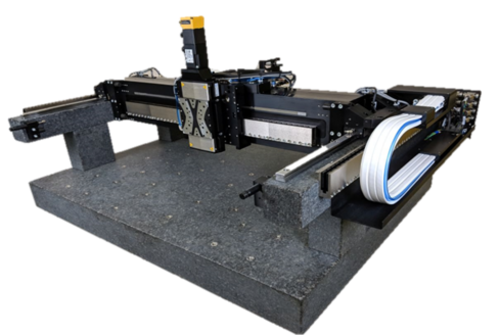 These applications often require large multi-axis precision positioning stages, or gantries, linear motor driven with air bearings or mechanical bearings. High speed, perfect path control, and exact synchronization with cameras or laser trigger events on a microsecond scale matter. 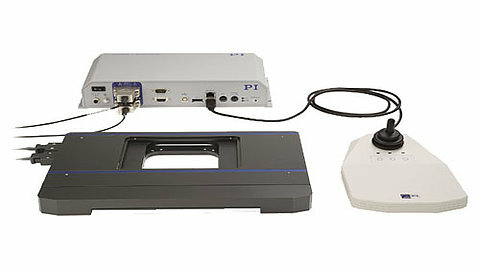 PI can provide the individual stage components, as well as the complete system including controls and software. 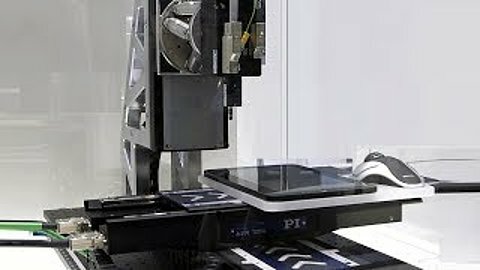 Due to their geometric performance and frictionless motion, air bearings have played a crucial role in the development and construction of coordinate measuring machines (CMMs) and other metrology tools for decades. 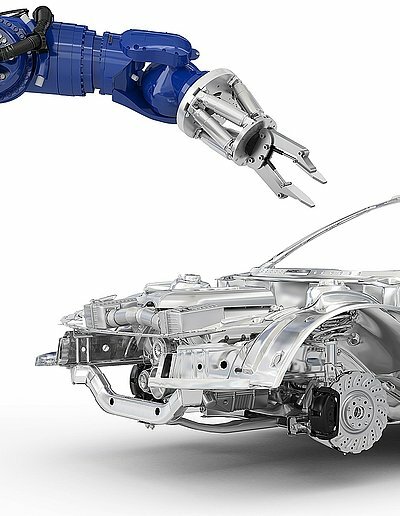 As the precision requirements in the automotive industry are increasing, the need for advanced robotics arises. 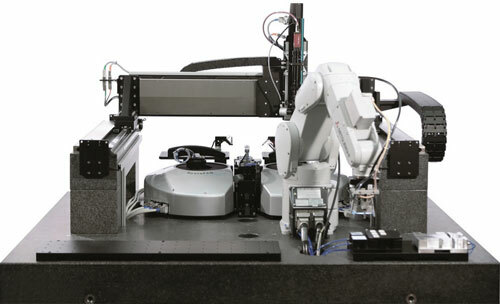 Traditional robots are fast, can handle heavy loads, but lack positioning accuracy. 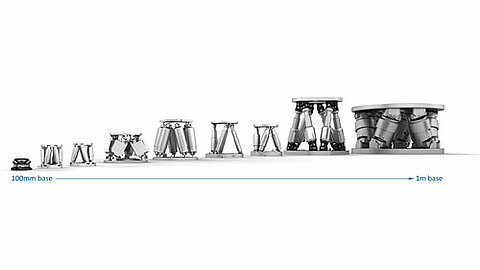 Hexapod robots have a long history in precision alignment & micro-manufacturing automation, but were considered too precise for the automotive industry. The situation is rapidly changing. 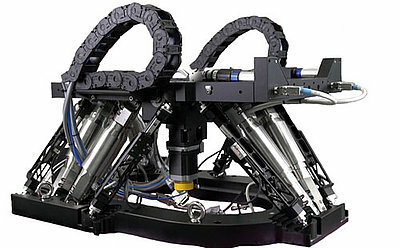 Best of two worlds example: Combination of a traditional articulated-arm robot with a hexapod parallel-robot provides long travel ranges and very high precision and flexibility. Advances in drug discovery rely on analysis of huge amounts of data and before that testing of large amounts of samples. 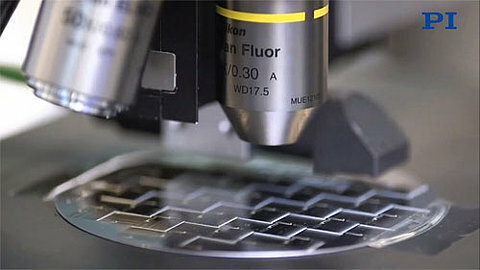 Increasing the throughput of these tests, requires highly repeatable ways of focusing down to sub-micrometer precision in milliseconds for perfect optical data acquisition. 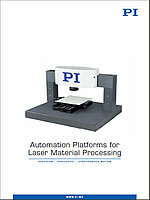 PI has designed piezoelectric drives and voice coil drives specifically for fast microscope automation applications. 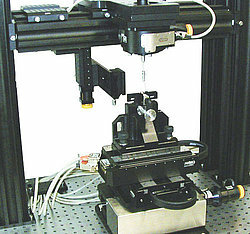 (top) PI P-725 PIFOC® Piezo Driven Nanofocus Systems are used for surface metrology and microscopy applications. Resolution and settling speed is typically 10 times higher compared to traditional motor driven solutions. (bottom) Self-locking ultrasonic piezo motor driven XY stage with very high dynamic range and extreme position stability. 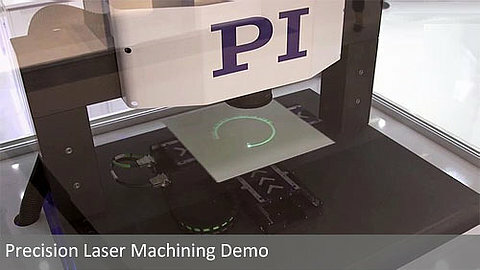 Additive nano-manufacturing and laser micromachining are disrupting technologies that both rely on precision motion control and positioning equipment. 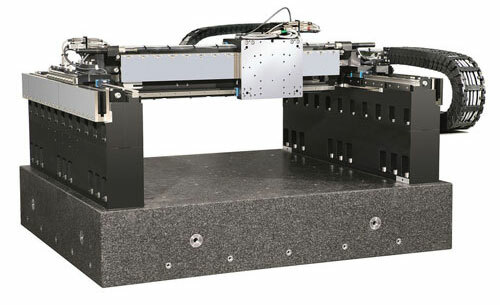 In the case of laser cutting, long-travel ironless linear motor stages virtually extend the field of view of a high-speed galvo scanner. The key to high accuracy and throughput lies in the synchronization of the scanner and the motorized positioning system. 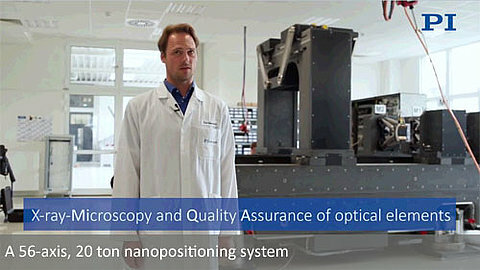 At the nanometer level, multi-axis piezo-mechanic nanopositioning systems make possible 3D nano-manufacturing based on laser lithography. 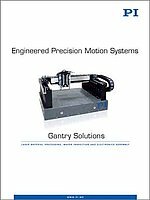 Focus and path precision are extremely critical requiring mechanics and servo electronics to provide nanometer precise trajectory control. MiQA is a 20-ton, 56-axis motion system of extraordinary precision, designed for for x-ray microscopy and quality assurance of x-ray optics. 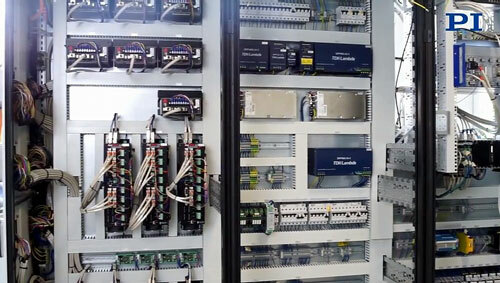 The system is equipped with 56 motors 16 controllers, 7 air bearing granite slides. In order to achieve this performance, the entire spectrum of PI’s precision technologies is put to use. 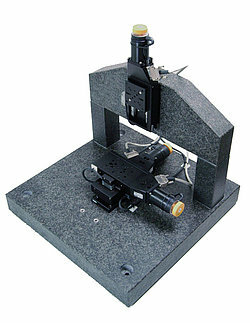 When operated in “Tomography Mode” the sample’s point of interest can be held inside a sphere with the diameter of 85 nanometers. 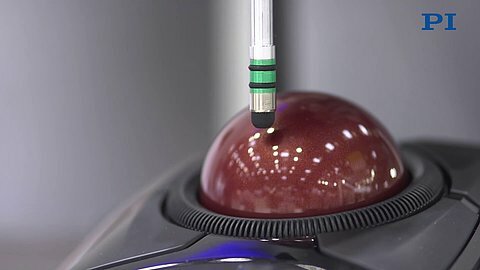 This extraordinary performance – considering the size of the machine - is an example for what our engineers can achieve based on the broad spectrum of precision technologies they have at their disposal.